I take a bite and do a double take. Did that taste like I think it did? I take a few more bites and yeah, this one is delicious. Hopefully you know that I love sweet flavors and this one has just the right amount of sweet awesomeness. Yes, it's one of those reviews where I am going to bring all my big, happy words in to the mix. A well crafted flavor should gel in to one great experience. Despite having salt, caramel, honey and almonds as the four flavor factors, they come together perfectly in one well designed flavor. 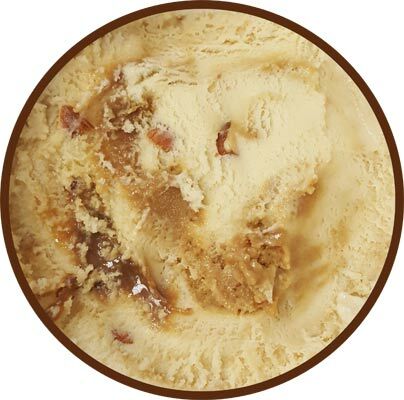 Unless you specifically aim for the mild honey ice cream base all by itself (which doesn't happen much), you will always get a good amount of caramel flavor. To be specific, you wont be bowled over with a super buttery caramel. It is a sweet caramel, and there is a nice saltiness worked in to it without it actually tasting like salt. The honey base gently accentuates and rounds out the overall flavor. 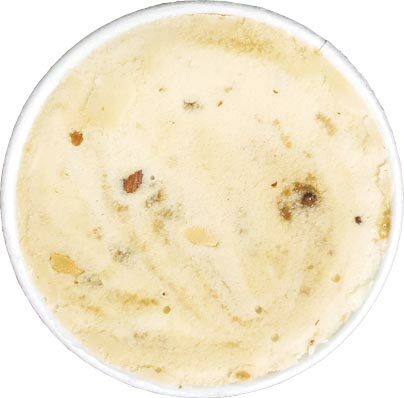 I tend not to like honey swirls because they tend to be too potent and ruin things for me, but going with an actual honey ice cream with such a great swirl and the smattering of almonds was a great choice. Delicious. Just delicious. I could have easily just sat and devoured this free pint but I'm going to try and be good and spread it's excellence out over three servings. Awesome job H-D.
On Second Scoop: My word is this delicious. If you can, I recommend eating this one slowly because I think I enjoyed it even more when I did... that probably sounds silly but I'm just trying to stress how well this one clicks for me. 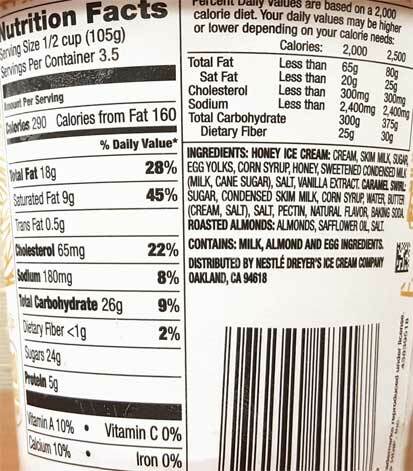 I'm not even a huge almond or honey fan, but it works really well here. 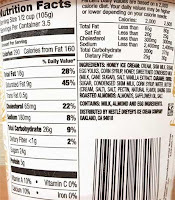 I actually noticed the almond flavoring more this time around but the flavor is just so balanced and well rounded (and sweet ofcourse) that I just wanted to keep eating and eating. I hope you get to try this one soon. I am SO looking forward to trying this one. I bet it would make a great "baklava" sundae if paired with something crispy. Friday night I ate a whole pint. I only meant to taste it but things got a little out of hand! I loved it too. I almost didn’t buy it because it had not been reviewed yet and the description really didn’t wow me. But Publix rarely gets the new stuff quickly so when I saw this one I bought it impulsively. Well, there's something to be said about this flavor, it's excellent. I'll try anything one, two, three times...if it's In-n-Out burger..5 times and I still hate it! With Ice Cream, typically once is all I need. It's either a BUY AGAIN and AGAIN or nah! This is deadly for me and I will buy more. Like I always say, because I like this flavor so much and it's not really a " Mainstream" flasvor, I'm sure it will be discontinued. WOW, the balance of Salty, Sweet, Crunchy is perfect here. A true ten, I can't find one thing to dislike about this flavor. I love this flavor so much every purchased it at least 4 times since its introduction. 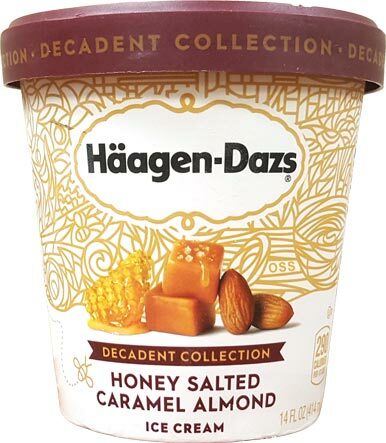 By far the best Haagen Dazs flavors this year! And I totally agree with the other comment, this one is deadly for me. This is probably the first ice cream I’ve ever tried in my life that I couldn’t put down after a couple of bites. I’m usually the biggest fan of the vanilla Swiss almond, but I can always restrain myself and just have a little bit at one time.